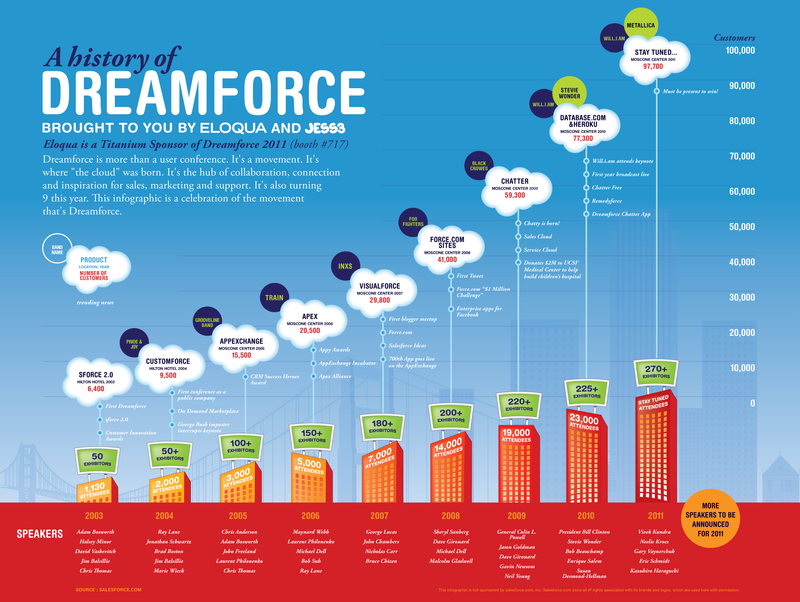 Salesforce.com enlisted JESS3 to create an infographic that celebrates the 10th annual Dreamforce conference, now the world's largest vendor technology conference in history, by showing its expansion over the past decade. The infographic charted the rise of the event in three ways: attendance, event milestones, and each year’s guest bands and keynote speakers. From 1,300 attendees and no musical performances in 2003, to 92,300 attendees and a performance by the Red Hot Chilli Peppers in 2012, there was significant growth to visualize. Using fanciful and eye-catching markers, the design style is both informational and promotional.